When you hear the term "luxury apartment," do you automatically assume it's out of your reach? In reality, renting a luxury apartment could be the smartest, most cost-effective way to enjoy the lifestyle you want. We've compiled a list with six of the major reasons why renting a luxury apartment makes sense. Do any of them surprise you? Calling a luxury apartment an economical choice may sound like a contradiction until you take a closer look. Once you pay the deposit and any application fees, the only expense is your monthly rent, utilities and renters' insurance. Buying a home or condo requires a substantial down payment along with property taxes, homeowner’s association fees, maintenance costs, major purchases such as a lawnmower and other ongoing expenses on top of a sizable monthly mortgage payment. It's difficult and expensive to keep up with the latest in home decor and appliances. Many apartments come with a "vanilla" interior that's generic and bland. 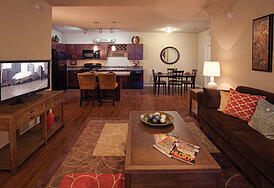 Almost by definition, luxury apartments are planned and maintained to incorporate current styles and features. Do you have your heart set on having a balcony? Maybe you dream of a spacious walk-in closet to accommodate your shopping habit. Our Springs Apartments communities offer an extensive variety of standard and optional features so you can find just what you're looking for. A vigorous workout followed by a dip in a refreshing pool is a great way to relax after work. One of the joys of summer is gathering with friends for an outdoor cookout. When you live in a luxury apartment, you don't have to head out to a health club, gym or local park. You have these activities and many more just steps away in your own community. Many standard apartment communities do not allow pets or put major restrictions on them. Pets are important members of many households. Springs Apartments welcomes dogs, cats, fish, birds, lizards, rabbits and just about any kind of beloved pet. If you have ever lived in an apartment community with absentee management, you are probably familiar with the frustration that can arise if you have a question or problem. When you live in a luxury apartment with on-site management, such as we have in our Springs communities, you can feel confident that someone is available to listen to your questions and address your concerns. If your bathroom sink springs a leak, you're not forced to call a pricey plumber or try to muddle through the repair yourself. Luxury apartments have the benefit of a dedicated maintenance team that will quickly and efficiently handle repairs with no cost to you. Emergencies don't follow a schedule, so our Springs maintenance teams are on call 24/7 for prompt response. Our Springs pledge is to deliver superior customer service for a first-rate resident experience. We rely on your comments and feedback to help us keep Springs Apartments as the #1 choice in luxury apartment communities.